In talking with my co-worker yesterday, we were discussing the memories that wine can create. Which wines you drank during special occasions and the great moments that are associated with such wines. She told stories of her father’s favorite winery, Silver Oak, and the treasured memories the wine created for her family. Growing up my parents were enthusiastic, but amateurish when it came to wine they consumed, it wasn’t till a trip to Napa later in life that changed their outlook on high-end wines. To put it into perspective I had to compare her treasured moments to my family’s love of baseball and all the memories that I shared with my father growing up. I have been a diehard NY Mets fan far as long as I can remember, and watching the Mets beat the Giants in a 16 inning drag out fight last night was amazing (Sorry Giants fans). The connections we can make between all passions in life are amazing. As I began thinking about Silver Oak and this blog last night while at the game, I thought of some of the great storied franchises in Major League baseball and the storied Silver Oak winery being a staple in Napa Valley for producing epic Cabernet Sauvignon for ages. It brought memories of the NY Yankees in the 1930s, & NY Giants in the 1920s. These dynasties can be considered exactly what Silver Oak has achieved in the wine industry; remarkable consistency for winning over a significant time period. The only thing that is not consistent is that sometimes these baseball franchises go dormant for a few years, ala my NY Mets for the past 10+ years, but with Silver Oak they make outstanding wines year in and year out. With Napa we have consistently seen good to great vintages, with poor vintages happening once in a 20 year span. However, even in these substandard vintages, Silver Oak Winemaker, Daniel Baron, has been able to turn out great wines. There is a phrase for this, “Great Winemakers make great wines in bad vintages.” This phase stands up for all of Silver Oak’s years in the business. The 2008 Vintage was phenomenal at Silver Oak and that was despite a small crop that was caused by a drought followed by frost, then a heat spike as harvest began. Most winemakers that I have spoken to regarding the vintage mentioned that the additional stress did create wines of exceptional quality and that the only effects of the climatic challenges were the disappointment of low tonnage. As a matter of fact, Wine & Spirits awarded the Silver Oak Alexander Valley Cabernet Sauvignon 94 points, and I must agree that the vintage was the best that I have tasted from Silver Oak and one of my top Cabernets from the 2008 vintages. 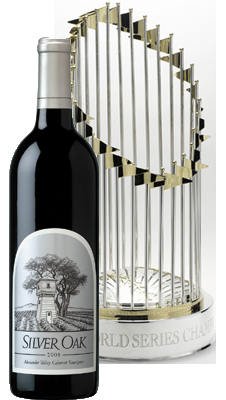 To tie this all together, the 2008 Silver Oak Alexander Valley Cabernet Sauvignon is my version of the 1986 NY Mets; a gritty, over performing team that showed promise through adversity, and won the World Series despite the challenges that were laid before them. I highly suggest getting your hands on this vintage while supplies last as it is the end of the vintage and it will not be around long. With its additional bottle aging this wine is drinkable now, but could be cellared for around 15 additional years to really enjoy the intricacies of this spectacular wine. Great wine. Soft and refined. Opened really well after about 30 minutes. Soft hints of oak and earth. Cheers! Complex with a mix of creamy vanilla-tinged oak dried currant herb pencil lead and sage notes that are tight and tannic ending with a mineral and pebble aftertaste. Well-balanced. Drink now through 2014. 33 400 cases made. -JL Wine Spectator. I truly love your website.. Pleasant colors & theme. Did you build this amazing site yourself? Please reply back as I'm hoping to create my own personal website and want to find out where you got this from or just what the theme is called. Many thanks! Quality posts is the main to invite the visitors to visit the website, that's what this web page is providing.